We’re picking up from where we left off last time, so go check that out to get up to speed. What happens if instead of only looking at two groups (skiers reaching the podium, skiers not reaching the podium) we get a little more sophisticated and include more information? It may look tempting to conclude that these two variables are correlated, but there’s less here than meets the eye. Beyond a best WJC result of 20th, there really isn’t much of a relationship at all. Below 20th, it seems like there might be one, but consider how variable the data are around the blue trend line. How informative is it when the data vary by as many as 40-60 places around the trend? 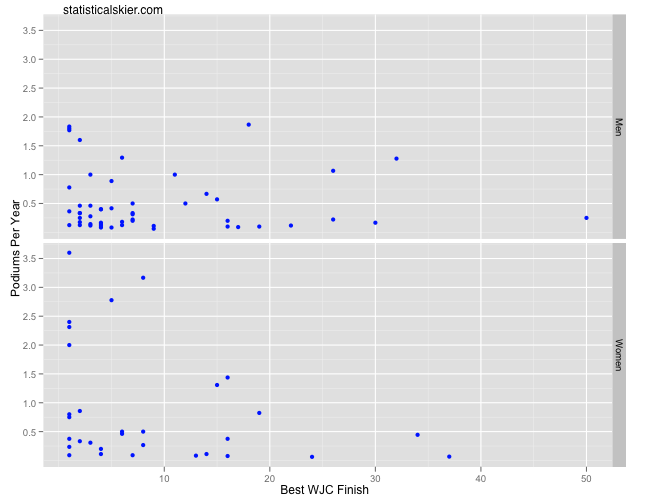 This is just a plot of each skier’s best WJC results versus the number of podium finishes per year they’ve had since their last WJC race. I’ve omitted the trend lines this time, but the relationship it actually even weaker. All this isn’t to say that nothing can be learned from Olympic medalists. Far from it. 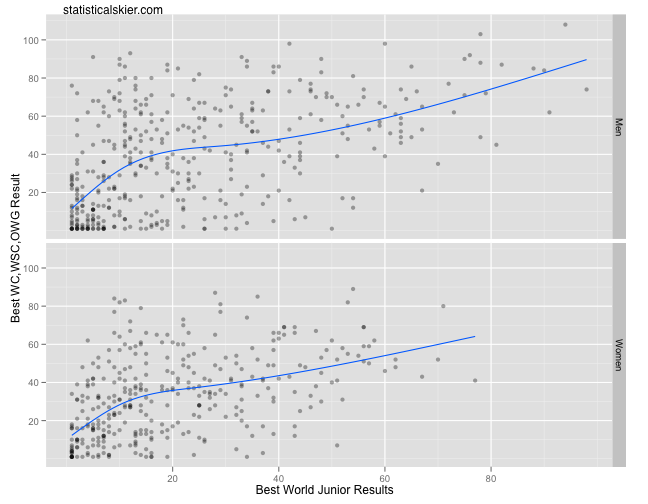 But we certainly can’t go very far with only WJC results to go on as a proxy for “speed as a junior”, and even if we fixed this problem, my guess is that it would be tough to see systematic differences. It just seems unlikely to me that there are (statistically significant) differences between the people finishing in the top three versus the people finishing in 4th-10th. Posted by Joran on Wednesday, August 4, 2010, at 7:30 am. Filed under Uncategorized. Tagged development, Distance, podium, WJC/U23. Follow any responses to this post with its comments RSS feed. You can post a comment or trackback from your blog. « What Does It Take To Win A Medal?